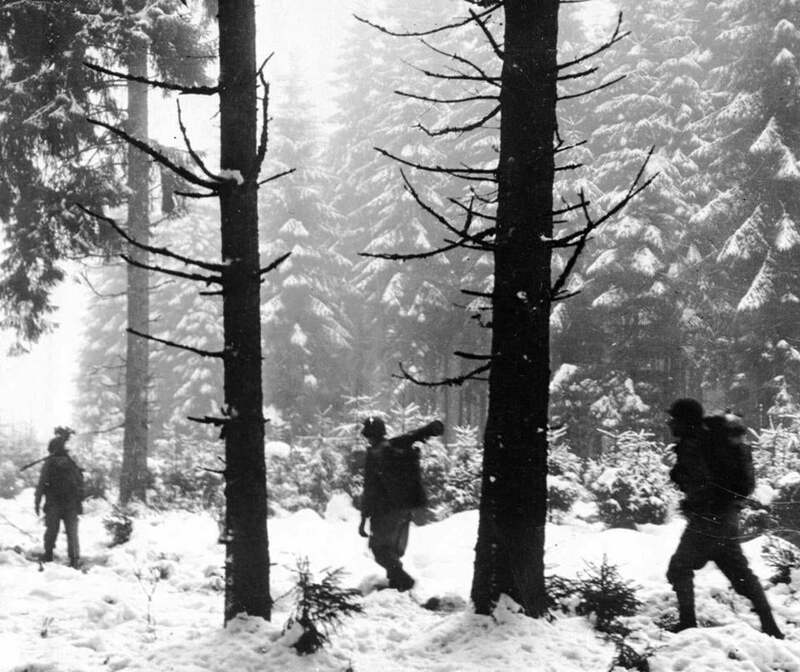 Infantrymen of the US First Army in Belgium’s Ardennes Forest as they advance to contact German forces at the start of the Battle of the Bulge. The war was all but over, or so they thought. The British War Cabinet was convinced it would be finished by Christmas. The American War Production Board canceled contracts for artillery shells. The Allies were in France; the Germans were in retreat. It was late summer 1944, and combatants on both sides were past exhaustion. In this latest installment in the war chronicles that he has produced in recent years, Beevor makes clear that there was still fighting to be done, and not just between the Axis powers and the Allies. Dwight Eisenhower would wrestle with Bernard Montgomery; Charles DeGaulle would struggle with just about everybody; German soldiers and German civilians would have their own psychological battles. Beevor paints a searing portrait of a world weary of war but unable to stop it as the combat dragged on in conditions so full of misery and privation that German soldiers — 60 percent of whom were infected with lice — eyed regimental horses for food. A plan proffered by US Secretary of the Treasury Henry Morganthau and publicized by German authorities to transform a defeated Germany into an agrarian backwater only served to stiffen that nation’s resolve. Reflecting the Allies’s miscalculation of the situation, Eisenhower had ordered the demobilization of resistance forces in Belgium in November. Adolf Hitler had other ideas. Since mid-September he had been thinking about a new offensive, a notion fortified by his conviction, which turned out to be correct, that the Allied coalition of capitalists and communists was inherently unstable, and his view, which also proved right, that a final lightning attack would catch his opponents off guard. But two rights in this case made for a dreadful military wrong. It was so totally irrational that it came as a total surprise. With insufficient food and artillery shells, the Allies battled on, fighting hard frost and cold wind. Beevor’s battle descriptions crackle with you-were-there authenticity. In one case, the award-winning historian details how entire Belgian villages, their residents summoned to central squares by the tolling of church bells, contributed bedsheets to be used to provide the GIs, whose uniforms stood out against the white snow, with camouflage. Unfortunately, the soldiers soon discovered that their protective coverings rustled when wet and frozen. A battle enabled by Americans’ failure to defend the Ardennes front sufficiently resulted in what Winston Churchill called “undoubtedly the greatest American battle of the war and will, I believe, be regarded as an ever famous American victory.’’ But the real meaning of this battle, and this book, is broader than this conflict alone: It led to American military supremacy that would have no challenge, at least in the West, to this day.